Urameshi Yusuke, 14 years of age, is constantly ditching school, causing trouble, and getting into numerous fights everyday. One day however, he does the unexpected, sacrificing himself to save a young child. The afterlife was not prepared for Yusuke, for they never thought he would make such a sacrifice. Nowhere to go, and dead, Yusuke becomes a ghost and must earn his way back into existence. Yusuke is "employed" by Koenma, who is in charge while his father and ruler of the afterlife, King Enma, is away. Under Koenma's command, Yusuke helps to stop menacing demons that threaten the lives of people everywhere; whether by stealing priceless and invaluable items and destructive weapons, or by wreaking havoc on humans everywhere. 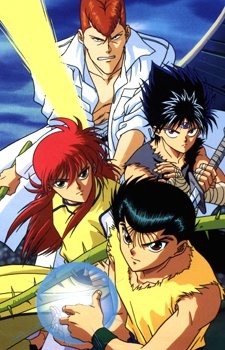 Watch Yu Yu Hakusho Episodes Online at Animegg.org. Yu Yu Hakusho is available in High Definition only through Animegg.org. Choose an episode below and start watching Yu Yu Hakusho in Subbed & Dubbed HD now.